Antiquarianism and collecting have been associated intimately with European imperial and colonial enterprises, although both existed long before the early modern period and both were (and continue to be) practiced in places other than Europe. Scholars have made significant progress in the documentation and analysis of indigenous antiquarian traditions, but the clear-cut distinction between “indigenous” and “colonial” archaeologies has obscured the intense and dynamic interaction between these seemingly different endeavours. This book concerns the divide between local and foreign antiquarianisms focusing on case studies drawn primarily from the Mediterranean and the Americas. Both regions host robust pre-modern antiquarian traditions that have continued to develop during periods of colonialism. In both regions, moreover, colonial encounters have been mediated by the antiquarian practices and preferences of European elites. The two regions also exhibit salient differences. For example, Europeans claimed the “antiquities” of the eastern Mediterranean as part of their own, “classical,” heritage, whereas they perceived those of the Americas as essentially alien, even as they attempted to understand them by analogy to the classical world. These basic points of comparison and contrast provide a framework for conjoint analysis of the emergence of hybrid or cross-bred antiquarianisms. Rather than assuming that interest in antiquity is a human universal, this book explores the circumstances under which the past itself is produced and transformed through encounters between antiquarian traditions over common objects of interpretation. "...a demonstration of the historical dynamism within two discrete locales of antiquarian endeavour is very welcome, particularly as it underscores an important truth: that antiquarianism can provide a more conducive space to explore, in concert with people who are not specialists, the diverse connections between past and present." 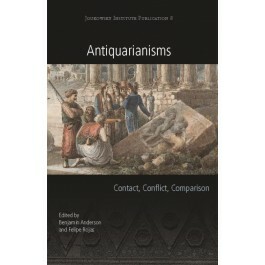 "Antiquarianisms is a significant contribution to current scholarship on antiquarian traditions. Not only does the volume add to Schnapp’s blueprint for comparing varying antiquarian practices, it also challenges its own goals and asks the reader to do the same in existing and future scholarship."